Peter Thiel’s support for Donald Trump in the 2016 U.S. presidential election has not only soured his relationship with Facebook CEO Mark Zuckerberg, but convinced the venture capitalist to leave Silicon Valley altogether — and possibly the Facebook board. One of Facebook’s earliest investors, Thiel has grown disenchanted with the tech haven because of its intolerance towards conservatives, according to a new report published Thursday in the Wall Street Journal. 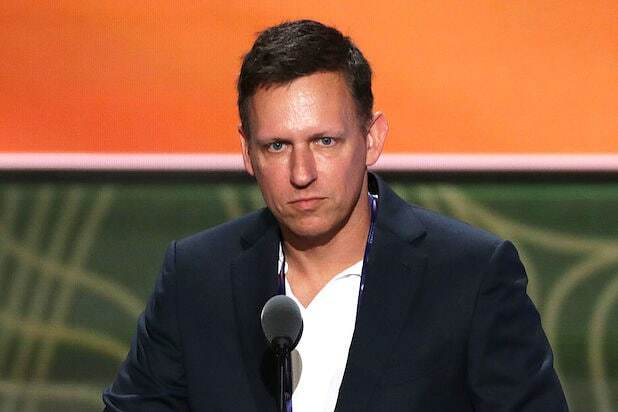 After spending four decades in Northern California, Thiel is relocating his home and investment firms to Los Angeles, according to the Journal. The 50-year-old has a 7,000-square-foot home overlooking the Sunset Strip. The 50 employees that make up Thiel Capital and Thiel Foundation are expected to move to L.A. as well, the paper wrote. Thiel’s support of President Trump has made him an outcast in left-leaning Silicon Valley, and irritated other members of Facebook’s board, where he’s been a director since 2005. Netflix CEO Reed Hastings told Thiel in 2016 he was showing “catastrophically bad judgment” by throwing his weight behind Trump, The Journal wrote. The billionaire investor grabbed headlines in 2016 for being the first LGBTQ speaker in the Republican National Convention’s history. Thiel and Zuckerberg discussed his position on the Facebook board at the time, according to the Journal, although Zuckerberg didn’t push him to resign. Thiel let Zuckerberg know he didn’t plan on leaving the board. The turnover in the Trump administration continues. Michael Flynn resigned in February 2017 as President Trump’s national security adviser after less than a month in the position. The move came after Flynn admitted he gave “incomplete information” about a call he had with the Russian ambassador to the U.S. last December regarding sanctions against Russia, The New York Times reported, and that he misled Vice President Mike Pence and other top White House officials about the conversation. Months after getting personal assurance from the president that he would remain in his job as a top federal prosecutor, Bharara was asked to submit his resignation in March 2017. “Had I not been fired, and had Donald Trump continued to cultivate a direct personal relationship with me, it’s my strong belief at some point, given the history, the president of the United States would’ve asked me to do something inappropriate,” Bharara said on his podcast. President Donald Trump fired FBI Director James Comey in May 2017 over his handling of the investigation into Hillary Clinton’s emails. Trump’s decision was based on the recommendation of both Attorney General Jeff Sessions and Deputy Attorney General Rod Rosenstein, according to Spicer. Michael Dubke, the first communications director in the Trump White House, resigned in May 2017 in the midst of ongoing blowback for the president's handling of the firing of James Comey. White House Press Secretary Sean Spicer resigned in late July 2017 when Trump hired Anthony Scaramucci as communications director. According to the New York Times, which first broke the news, Spicer told President Trump he vehemently disagreed with the appointment of New York financier and former Fox Business host Anthony Scaramucci as communications director. Priebus was ousted from his position as White House Chief of Staff in July 2017, when Donald Trump hired General John Kelly to take his place. "I am pleased to inform you that I have just named General/Secretary John F Kelly as White House Chief of Staff. He is a Great American,” Trump said in a tweet. Scaramucci was the White House Communications Director for 10 days last summer and is now infamous for a wild, expletive-filled interview with The New Yorker's Ryan Lizza. He announced in late September week that he will launch his own media website, called The Scaramucci Post. Sebastian Gorka announced his decision to exit his role as deputy assistant to the POTUS in a letter to the president in late August 2017. White House Chief Strategist Steve Bannon was reportedly fired in August 2017, though he insists he resigned July 27 -- giving two weeks’ notice -- but his leaving was put off because of the events in Charlottesville, Virginia. He returned to Breitbart News, where he vows to go to “war” for Trump. Following a week-long scandal over his lavish use of private jets while traveling on government business, Health and Human Services secretary Tom Price resigned on September 29. 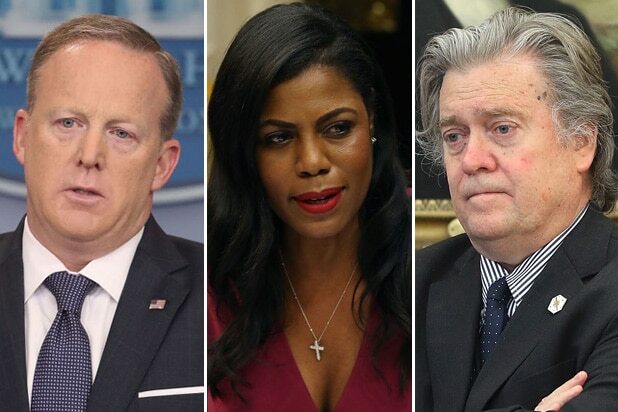 Former "Apprentice" contestant Omarosa Manigault Newman resigned in December "to pursue other opportunities," according to a White House press release. Trump thanked her for In February 2018, she became a contestant on "Celebrity Big Brother," and bashed Trump in the first episode. Centers for Disease Control director Brenda Fitzgerald resigned in January 2018 after a Politico report that she bought shares in a tobacco company one month into her role. Staff secretary Rob Porter left the White House in February 2018 after his two ex-wives both detailed accusations of domestic abuse. Reports emerged that senior aides knew about the allegations for months but did nothing until more details came out to the public, sparking backlash. Trump praised Porter's character and reiterated that he had proclaimed his innocence. Just one day after testifying before the House intelligence committee in February 2018, the White House Communications Director and longtime Trump loyalist announced plans to resign. The former head of PR for Hollywood producer Jason Blum's Blumhouse announced in February 2018 that he was leaving his job as a senior communications aide at the White House after less than a year on the job. Cohn, considered one of the most liberal members of Team Trump as director of the National Economic Council, announced in March 2018 he was leaving after a disagreement with Trump over tariffs on steel and aluminum imports. He had previously been mentioned as a possible chief of staff. McEntee was abruptly fired after serving a year as the president's personal assistant, the Wall Street Journal reported on March 13, 2018. The paper cited an unspecified security issue as the reason for the dismissal. The secretary of state was abruptly asked to resign in March 2018 after just over a year in the job. The former CEO of Exxon Mobil arrived at the State Department with no experience in government or diplomacy and soon ran afoul of both his agency and Trump, particularly after reports emerged that Tillerson had called the president a "moron" following a cabinet meeting. The lieutenant general, picked by Trump to be his second national security adviser, resigned March 22, 2017, and replaced by former United States ambassador to the United Nations, John Bolton. The U.S. Secretary of Veterans Affairs was removed from his post in March 2018 following a scandal over travel expenses involving his wife. The White House lawyer who had overseen legal issues related to the investigation into Russian interference in 2016's presidential election announced on May 2, 2018, that he was leaving his position. The administrator of the Environmental Protection Agency resigned on July 5, 2018 after months of reports about his spending practices and ethics. Peter Thiel Moves to Buy Gawker Assets – Does He Just Want to Delete Archive of Site He Killed?